One of my favorite characters from a Classic Hollywood romantic comedy is Lew Ayre’s Ned Seton in Holiday (1938). The film is directed by George Cukor, the gay son of Hungarian Jewish immigrants and nicknamed a “woman’s director,” ostensibly for his skill with “difficult” actresses but equally as a homophobic slur. Such indirect attack was Hollywood’s stock in trade, behind the scenes and before the camera, and Cukor knew how to roll with the punches and come up smiling. Playwright Philip Barry, who wrote the original scripts for Holiday and The Philadelphia Story (1940) (also directed for the screen by Cukor), also understood the demand for subtlety. His drawing-room romantic comedies focus on the lives of the wealthy. The plays do offer criticism of social ills, although materialism doesn’t concern him so much as snobbery in the upper class, as well as intolerance within the middle class for the upper. Barry is also known for the strong parts he wrote for actresses, which include some sensitive consideration of how adherence to traditional gender roles harms both women and men. Moreover, as stage director Jack Marshall noted in 2003, “Nobody could write between the lines better than Philip Barry.” Writing “between the lines” is exactly what a playwright in the 1930s would have to do if he wanted to address not only sexism but also homophobia. 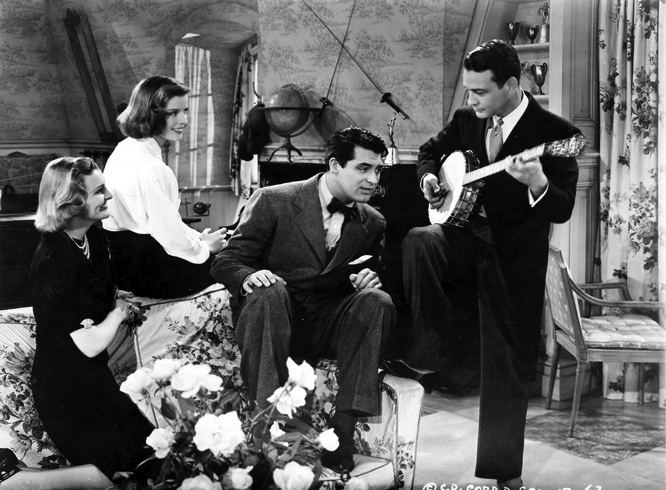 Holiday is the story of the upper-crust Seton family and their encounter with young entrepreneur and man-of-the-people Johnny Case (Cary Grant). Taking his first vacation since he worked his way up from the working class into banking, Case meets lovely Julia Seton (Doris Nolan), and the two fall in love. When the family patriarch Edward Seton (Henry Kolker) sees that Johnny has prospects for a wealthy future, he grants his permission for marriage. 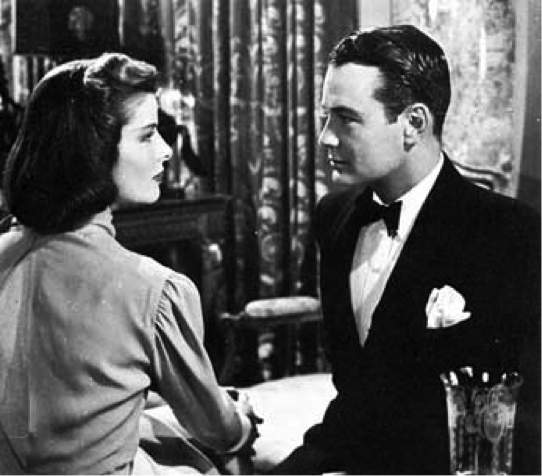 There is much rejoicing, especially from eccentric sister Linda (Katharine Hepburn), who sees in Johnny a “breath of fresh air.” Long-suffering brother Ned (Lew Ayres), who has been forced to accept a position in the family banking business and uses alcohol to cope with his inescapable misery, musters enthusiasm as well…and perhaps even more. Soon the bubble bursts, however, for once Johnny makes his first million, he tells the Setons of his plan to take a “holiday”: to retire young and see the world, so that when he does return to work, he’ll know what he wants to do and why. Only Linda and Ned seem to understand what he wants, while Julia and her father do all they can to force Johnny to stay working, to be all he can be in the banking world, just as previous generations of Setons have done. Although he tries to acquiesce because of Julia, eventually Johnny sees the Setons will never understand a man like him. He leaves the family to go on his holiday with the Potters, his kind, middle-class teacher friends (played by Edward Everett Horton and Jean Dixon). Linda sees this as her opportunity for love and follows Johnny, leaving Julia scoffing that she doesn’t want this difficult man anymore, even as she opines that Linda doesn’t stand a chance with him. A drunken Ned, stuck with Julia, Edward, and the family business, ends the scene by raising a toast, first to Linda and then to Grandfather Seton, who made the family fortune – but also made Linda. The film concludes with the union of Johnny and Linda aboard a ship for who-knows-where with the Potters, their kiss reassuring us that all is as it should be. But is it? Julia will find some stuffed shirt to marry in no time, we can be sure. With her looks and money, few men would be as stubborn as Johnny when it comes to following her rules. But we may also ponder whether, in another era, Julia might spend her energy not on the right man to uphold her status but on her own life outside the home. If the film were made today, she’d be the one preparing to take over the business, not the miserable, unwilling Ned. This context, and the reasonable assumption that Julia must harbor frustration at her inability to inherit the company reins except indirectly through a husband, can provide some sympathy even for cold, calculating Julia, who actually does seem to love Johnny, in her way, at least early in the film. The future that Julia cannot claim also does Ned great harm. We learn from Linda that he is a musical prodigy, a sensitive artist who was forced to abandon his talents to follow in his father’s footsteps at the bank. His response, like Linda’s until late in the film, is to give in to the demands of family, class, and gender expectations. Linda hides in a small “play room” on the third floor of the Seton brownstone, a comfortable space her deceased mother designed. Ned hides at the bottom of a bottle. It is not surprising, in this context, that the film offers additional circumstantial rather than direct evidence of his sexual orientation. Ned shows no romantic interest in women in the film, nor do his father or sisters encourage such interest. We can also read his alcoholism through psychological theories that read heavy drinking as part of “attempts to medicate emotional problems such as depression, anxiety, and anger”; “compensat[ion] for feelings of inferiority or powerlessness” or “lack of rewarding alternatives in life” (Young 1998). Most relevant to the 1930s were explanations of substance use “as a substitute for unacceptable sexual or aggressive drives […,] as a defense against homosexuality” or “as slow suicide” (Young 1998). Certainly, when Linda asks how long one can last, drinking away sadness, Ned can only say it is good for as long as it lasts. Linda replies, “That’s awful,” and eventually finds her alternate solution in running away with Johnny. Ned does not have this option, nor is any kind of repressed triangle a viable option.